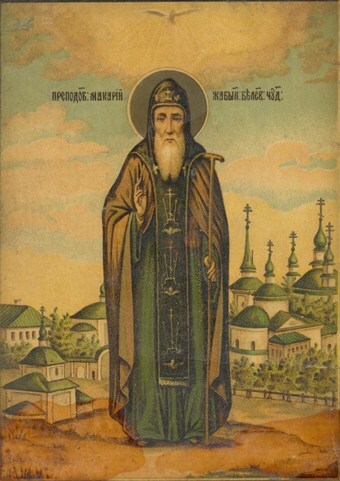 Venerable Macarius of Zhabyn, Wonderworker of Belev, was born in the year 1539. In his early years he was tonsured with the name Onufry, and in the year 1585 he founded Zhabyn’s Monastery of the Entry of the Most Holy Theotokos into the Temple near the River Oka, not far from the city of Belev. In 1615 the monastery was completely destroyed by Polish soldiers under the command of Lisovski. Returning to the charred remains, the monk began to restore the monastery. 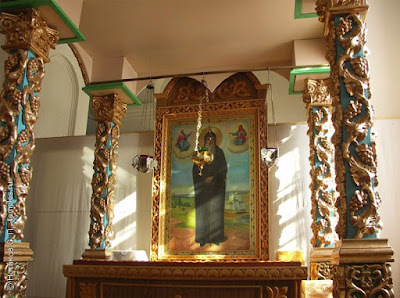 He again gathered the brethren, and in place of the wooden church a stone church was built in honor of the Entry of the Most Holy Theotokos into the Temple, with a bell-tower at the gates. Onufry spent his life in austere monastic struggles, suffering cold, heat, hunger and thirst, as the monastery accounts relate. He often went deep into the forest, where he prayed to God in solitude. Once, when he was following a path in the forest, he heard a faint moaning. He looked around and saw a weary Polish man reclining against a tree trunk, with his sword beside him. He had strayed from his regiment and had become lost in the forest. In a barely audible voice this enemy, who might have been one of the destroyers of the monastery, asked for a drink of water. Love and sympathy surged up within the monk. With a prayer to the Lord, he plunged his staff into the ground. At once, a fresh spring of water gushed forth, and he gave the dying man a drink. When both the external and internal life of the monastery had been restored, Onufry withdrew from the general monastic life, and having entrusted the guidance of the brethren to one of his disciples, he took the schema with the name Macarius. For the place of his solitude, he chose a spot along the upper tributary of the River Zhabynka. About one verst separated the mouth of the tributary and the banks of the River Oka. The ascetical struggles of Macarius were concealed not only from the world, but also from his beloved brethren. He died in 1623 at the age of eighty-four, at the hour when the roosters start to crow. He was buried opposite the gates of the monastery on January 22, the commemoration of Saint Timothy, where a church was later built and named for him. 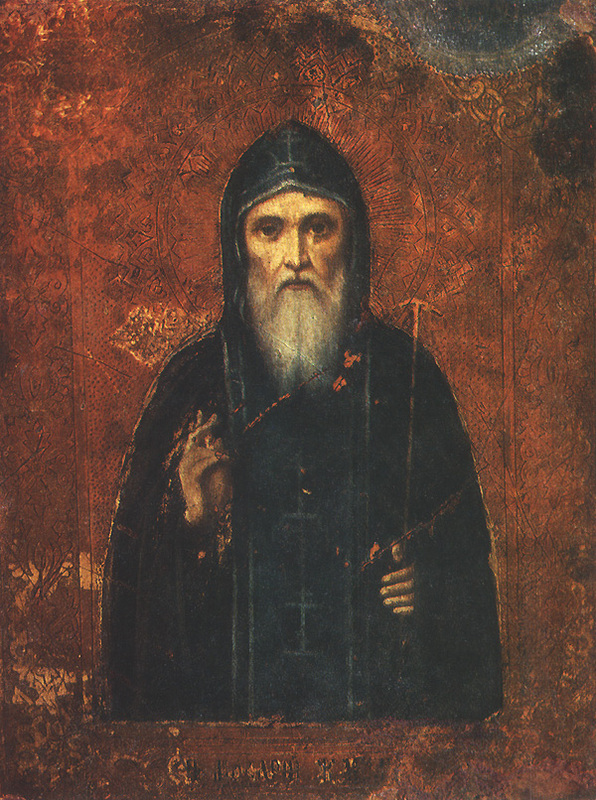 The Iconographic Originals has preserved a description of Saint Macarius in his last years: he had gray hair with a small beard, and over his monastic riassa he wore the schema. Veneration of Saint Macarius was established at the end of the seventeenth century, or the beginning of the eighteenth. According to tradition, his relics remained uncovered, but by 1721 they were interred in a crypt. In the eighteenth century the monastery became deserted. The memory of his deeds and miracles was so completely forgotten, that when the incorrupt relics of the monastery’s founder were uncovered during the construction of the Church of Saint Nicholas in 1816, a general panikhida was served over them. 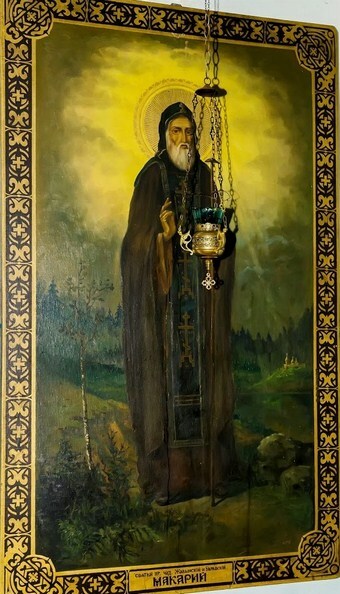 The restoration of the liturgical commemoration of Saint Macarius of Belev is credited to abbot Jonah, who was born on January 22 (the Feast of Saint Macarius), and who began his own monastic journey at the Optina Monastery not far from the Zhabyn Monastery. In 1875 Abbot Jonah became head of the Zhabyn Monastery. His request to re-establish the Feast of Saint Macarius was strengthened by the petition of the people of Belev, who through the centuries had preserved their faith in the Saint. 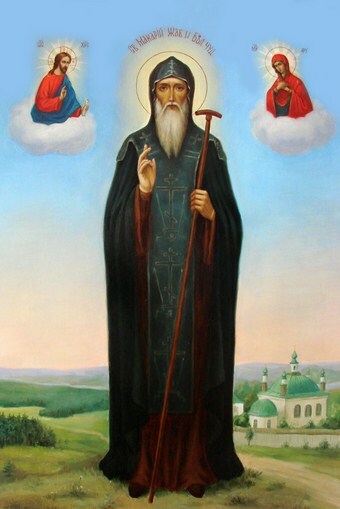 On January 22, 1888, the annual commemoration of Saint Macarius of Zhabyn was resumed. His commemoration was greatly enhanced when an incurably ill child was inspired to dip himself into the fountain of the monastery, and he emerged cured, causing many to flock to the monastery. 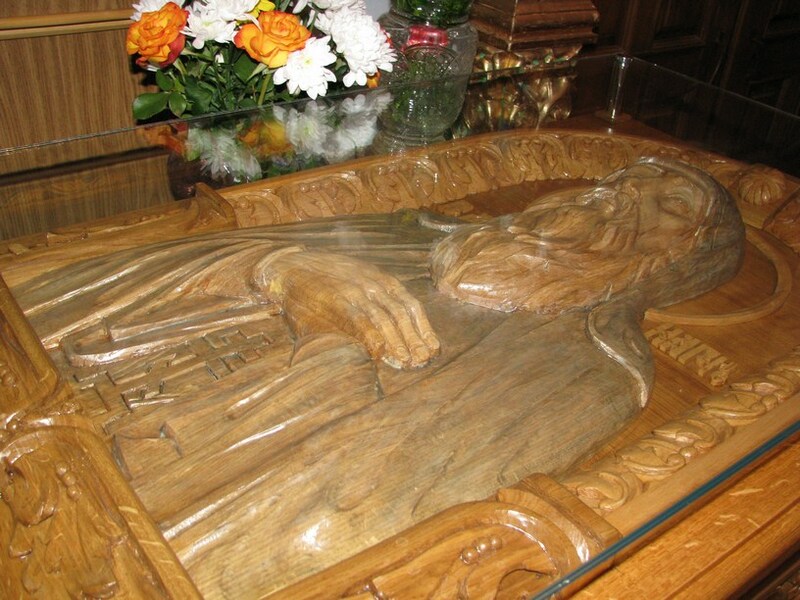 In 1889, a church dedicated to Saint Macarius was built at his tomb. 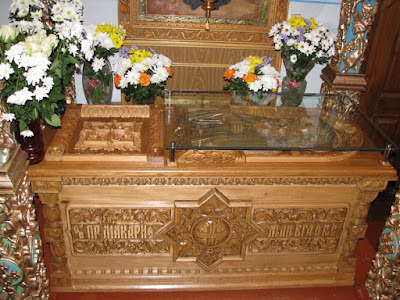 Abbot Jonah, who lived at the monastery and actually participated in the construction, decided that in addition to the building project, the holy relics of Saint Macarius would also be uncovered. 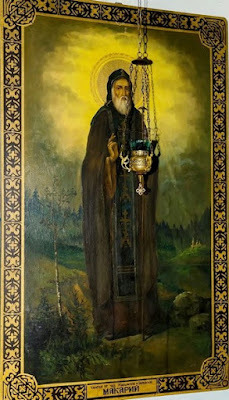 When everything was on the point of readiness, Saint Macarius appeared to the participants and sternly warned them that they should not proceed with their intention, or they would be punished. The memory of this appearance was reverently preserved among the monks of the monastery. The following two of many miracles took place through the intercessions of Venerable Macarius. A certain woman had a son who suffered with dropsy of the head, causing his head to greatly enlarge. With bitter cries the mother sought the aid of physicians to help her son, but they were unable to help. Some pious inhabitants of the city of Belev told her to go on foot to the Zhabyn Monastery and pray to Saint Macarius. There she went to the church and fountain of the Saint, where he labored, and prayed with tears. Upon her return home, she found her son to be quite healthy and assumed his usual appearance. She found out that he began to recover while she prayed for him. With tears of joy and words of gratitude they both went to the monastery and venerated the Saint. Another woman had fallen dangerously ill, so that she was unable to move without help. Doctors were unable to treat her. Suddenly she had a burning desire to go to Zhabyn Monastery. Her husband tried to persuade her not to go, as the trip could put her in danger, but she insisted. Arriving at the monastery, she wanted to immerse herself in the fountain, but her husband advised her not to do that, and only to wash herself. With faith in God and His Saint, she insisted on being immersed. With help she was immersed in the fountain, then was able to walk out on her own. For this she glorified God and Saint Macarius.